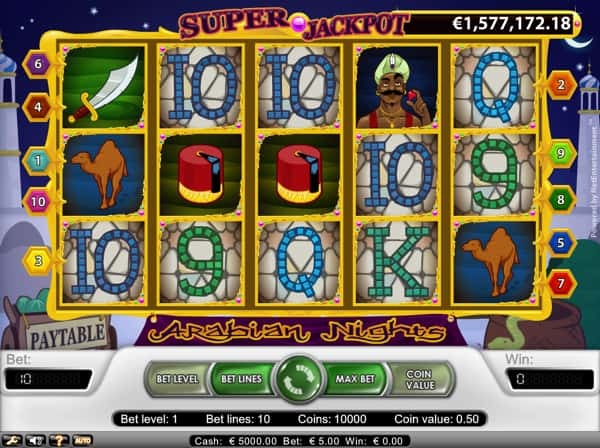 If you ever in the mood to play something more exotic and you enjoy the intriguing stories of Aladdin and Sinbad, then you will fall in love with the fascinating video slot called Arabian Nights. Developed by Net Entertainment, you have the perfect opportunity to travel back to the 13th century and indulge in the Arabian world while searching for hidden treasures. Arabian Nights is presented on 5 reels with three rows and features 10 pay lines. The bonus features include scatter symbols, wild symbols, a lucrative progressive jackpot, a free spin feature and a top paying jackpot bonus worth 10,000 coins in the base game. Arabian Nights was released nearly to ten years ago, and therefore the overall design and graphics won’t be the same standard of today’s video slots. The addition of a progressive jackpot featured in Arabian Nights has provided a very strong position for this slot game in the online gaming industry, providing some life changing experiences for a few lucky winners over the years. The Arabian Nights progressive jackpot has been claimed three times with the biggest recorded win of 8.6 million. The average progressive pay-out ratio occurs every 1 year and 34 weeks with an average pay out of 4.2 million. The background takes place in the Middle East, featuring a desert with shifting sands a very long time ago. You will find a wide variety of Arabian temples scattered on either side of the reels with fruits and pots located below the reels. The reels are positioned under a night sky with several stars shining above the reels and the moon making an appearance on the right-hand side of the screen. The reels and each symbol featured on the reels are beautifully decorated in a solid gold trim to compliment the look and feel of the game. The betting platform located underneath the reels has been presented in an incredibly simplistic manner and received a white and green colour scheme to add a calming effect when you play for extended hours. There is a total of 10 theme related symbols presented within Arabian Nights. The five high valued symbols include a broad curved sword displayed in front of a bright green backdrop, paying the highest jackpot bonus worth 2,000 coins, a pair of green and yellow pointed shoes paying the second highest jackpot bonus worth 1,000 coins, a white and red tent, a gold and red fez hat and a lonely camel in front of a dark blue backdrop. The lower valued symbols include 9, 10, J, Q, and K and received a mosaic design paying between 75 coins and 150 coins when five of each symbol is triggered on an active pay line respectively. Before you venture into the desert to locate several hidden treasures, you will first need to activate the number of pay lines to suit your playing style. You can choose to activate between 1 and 10 pay lines while betting up to 10 coins on each of those pay lines. Unfortunately, you will not be able to adjust the coin denominations and therefore the minimum bet you can wager per spin will be £5.00. The maximum bet you will be able to place on a single spin is £50.00. Arabian Nights also comes packed with interesting additional features such as the Auto Play feature where you can select between 15 and 1,000 spins to be played automatically. You can also utilise the advanced auto play feature settings to determine when the auto play feature should stop on a specific win amount or when your bankroll reaches a certain cash balance. You will also be able to decide if you want the music and sound effects to be switched off during play and the game is presented with a Max Bet feature to play the maximum bet with the click of a single button. The Arabian Prince wearing a green hat represents the wild symbol and will stand in for all other symbols except the scatter symbol. The wild symbol will also assist you in claiming the progressive jackpot while serving as a wild multiplier symbol as well. If you utilise the Arabian Prince wild symbol to help you in completing a combination win, your winnings for that combination will be doubled. If you are unable to place the maximum bet and manage to display five Arabian Prince wild symbols, you will forfeit the progressive jackpot. However, you will still be awarded 10,000 coins that will not be doubled when the winnings are credited to your bankroll. The Oil Lamp icon acts as the scatter symbol and displaying two, three, four or five oil lamp scatter symbols will award you with 2x, 5x, 20x, or 500x your bet respectively. The scatter symbol will also unlock the free spin feature in the game. The free spins round can trigger with three or more oil lamp scatter symbols anywhere on the reels. Once triggered, you will receive 15 generous free spins and every win during the free spin feature will be tripled. You can also re-trigger the free spins round by displaying three more oil lamp scatter symbols on the reels. The most unique and lucrative feature in the Arabian Nights video slot has to be the progressive jackpot displayed above the reels. You can claim the progressive jackpot by displaying five Arabian Night wild symbols on an active pay line. However, you will need to place the maximum bet in the game in order to qualify for the progressive jackpot. Arabian Nights from Net Entertainment is considered one of the most lucrative slot games in the online gaming industry. Although the sound effects and graphics are a bit out of date, it remains an impressive slot game with numerous bonus features and a lucrative progressive jackpot. The Return to Player has been set to 95.20% with a medium variance to provide frequent winnings with some amazing pay outs. We have embedded the Demo-version of Arabian Nights so that you can try the game for free. You can find the slot at LeoVegas Casino and Spinit Casino if you want to play with real money.